Love Holy Basil Extract by Planetary Herbals can't always afford it but being on sale it was my chance to buy it. Great for stress. 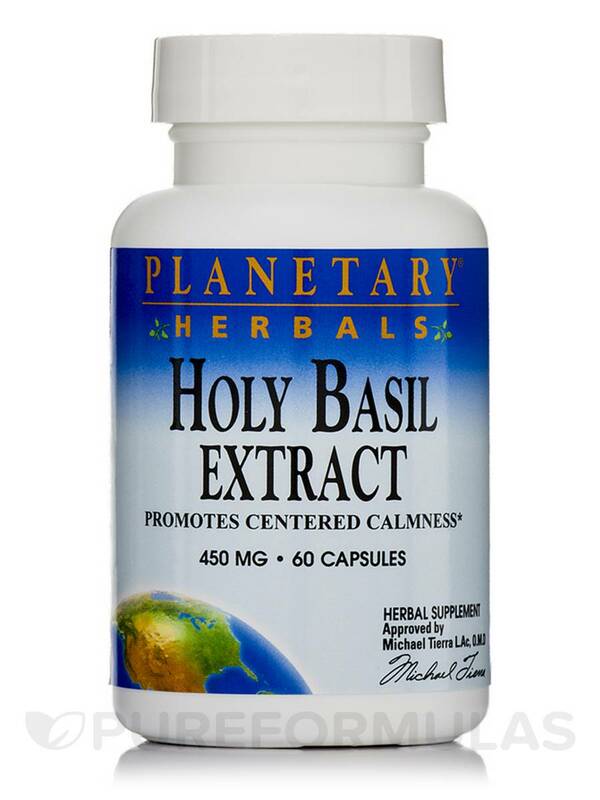 Holy Basil Extract 450 mg 60 Capsules from Planetary Herbals may help you adapt to physical and mental stress better. Tulsi‚ as it is called in India‚ is believed to have adaptogenic properties. Ancient Ayurveda uses the leaves‚ stem and seeds of this herb and believes that this herb may counter a variety of conditions. People of all age groups must combat with stress and many health care professionals believe that stress may soon become a major killer. Stress related to work‚ life and relationship may have harmful effects on human beings and can jeopardize health too. It is probably why many people believe that this herbal remedy from Planetary Herbals may be your answer. Stress can create imbalances in cyclooxygenase-2 (COX-2) and cortisol levels in the body. This can in turn take a toll on the blood sugar levels. 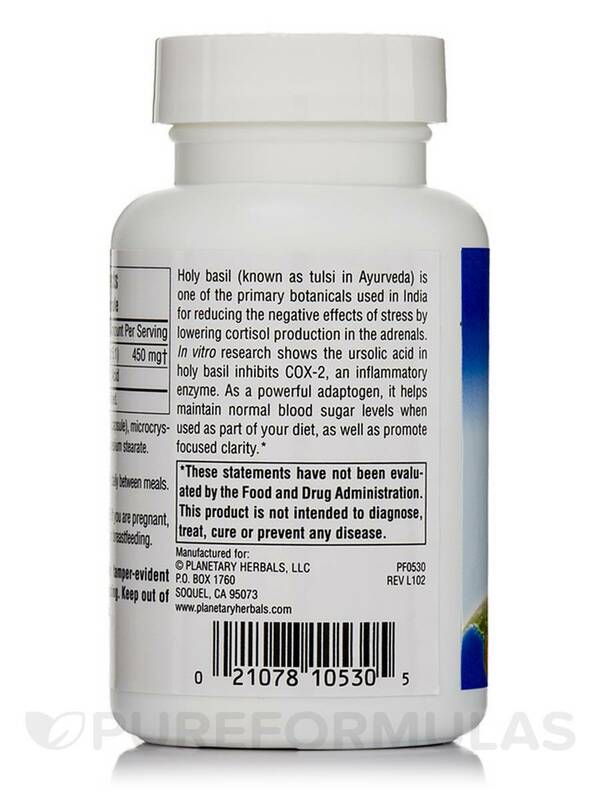 The holy basil extracts as present in this Planetary Herbals supplement may be successful at regulating cyclooxygenase-2 (COX-2) enzyme and cortisol levels to bring a blood sugar balance. Components such as eugenol and rosmarinic‚ present in holy basil may help reduce stress levels by helping our body adapt to physical and mental stress along with maintaining the overall well-being. Holy Basil Extract 450 mg 60 Capsules from Planetary Herbals may well be your answer for minor aches‚ pains and stress related to daily life. & I like Planetary Herbs. Good company very affordably priced. Great price from company & Great, Free Shipping from PureFormulas. Still not crazy about magnesium stearate included in otherwise great products. 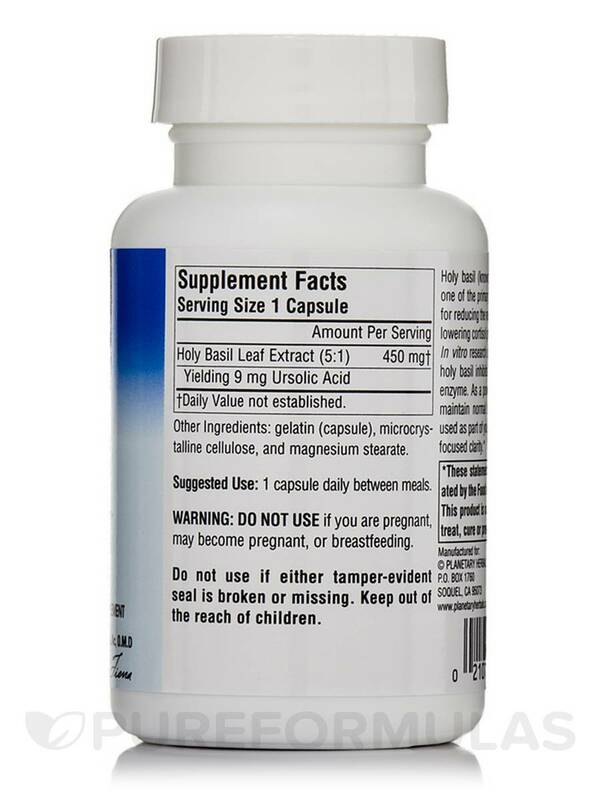 Started taking Holy Basil Extract from Planetary Herbals based on a recommendation from a health professional who believes in the natural way, due to after a saliva cortisol test, I had 'high' results in afternoon/evenings. This product does the trick and works great. Highly recommend (only) after you get your results and need to correct those highs. Love that it just calms the adrenals and brings me 'back down to earth' during those periods of 'highs' based on my lab results. I love this company so much and I just love this Holy Basil Extract 450 mg by Planetary Herbals. I would take 1 pill in the morning and 1 pill in the later part of the day to help with anxiety. This stuff works so well I swear by it. It helped me through some extremely stressful times in my life . Thank god I had this stuff! Everything with this item is positive, no cons. Works effectively to reduce effects of stress. Holy Basil Extract is very good for relaxation.